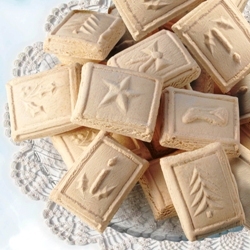 For centuries, these cookies have been a Christmas tradition in Bavaria and Austria. After settling in America in the 19th century, Benedictine Sisters in Indiana preserved this craft, each year creating these hard-to-find cookies the Old World way. These anise-flavored cookies are made from a simple egg-and-flour dough, sweetened with sugar and honey. Using specially carved cookie molds, the Sisters press a variety of Christmas-inspired designs into the dough before baking. The result is a firm and tender cookie that is a perfect accompaniment to coffee, tea or your holiday egg nog. Each box contains one dozen cookies (about 2" long). The Ferdinand Benedictines are one of the largest Benedictine communities of women in the United States. The religious community numbers 173 women, about 115 of whom currently live in Ferdinand at Monastery Immaculate Conception. The sisters serve in the areas of education, parish work, health care, counseling, retreat and spirituality work, social services, and mission work. 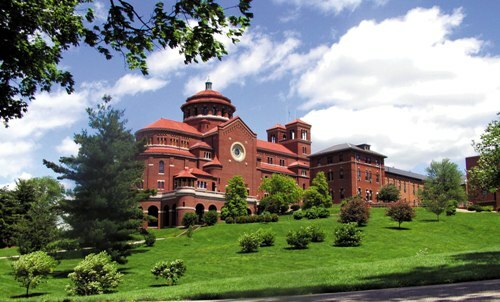 The Sisters of St. Benedict of Ferdinand were founded in 1867 by four young Benedictine sisters who came from Covington, Kentucky, to teach Ferdinand's German settlers. In the past 140 years, over 1,000 women have entered the Ferdinand Benedictine community. Their faith, spirit, and energy have led to the establishment of six independent monasteries—in Arkansas, North Dakota, California, Louisiana, Indiana, and Kentucky—and missions in Peru and Guatemala. Apr 15, 2019 | By ANNIE K.
Don't wait for Christmas to orders these. I purchase them for the company and we give them away as gift.. of course keeping some for ourselves. YUMMY! Feb 25, 2019 | By Randi T.
Seriously? I have been ordering these wonderful cookies for years ... my husband's grandmother used to make them, I tried and couldn't duplicate but he loves these!! He went through one box at his birthday week and another is in the freezer ... thank you! Feb 8, 2019 | By Teresa F.
As a child my German Grandmother made these cookies at Christmas. My husband created a memory I had lost by finding these cookies online from you. What a wonderful 65th birthday present. I placed 5 orders of Springeler cookies. Every recipient said they were the best they ever tasted. Other companies sent ones that were hard as a rock and tasted stale. Yours were soft and fresh, a true delight. I can't wait for next year when when place these orders again. Thank you.! These cookies are wonderful. 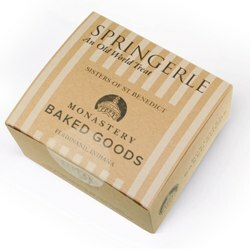 Springerle cookies are hard to come by...I'm glad to have found Monastery Greetings. And...I'm really glad that they offer these cookies. I have been looking for commercial Springerle cookies for years (sadly, I'm not the cook my mom was). Then I found these and...wow...just like my mom used to bake (almost, close enough). I ordered more to share with my brother. Thanks to the Sisters of St. Benedict! Dec 20, 2018 | By Donald F.
The look like and the texture is like my Swiss grandmother used to make, but they have too much anise flavor in them; it's overpowering. These are beautifully made and authentic cookies. People who like the taste of anise will love them. Mine have already been eaten! Jul 23, 2018 | By Patty L.
Everything was perfect. Easy to order, Shipped when it was suppose to. Well packaged. Best part, the cookies are excellent. Springerles are the best !! Feb 19, 2018 | By Keith A.
Feb 14, 2018 | By Eugene G.
Brought back so many memories. Deliciously perfect! I'll be back for more soon. Jan 23, 2018 | By George S.
I ordered a little too late to get delivery by Christmas but these are my wife's favorites and late is still good. I wanted these to taste like my Grandma made and they did! Will be ordering again next year. My neighbor made these springerle years ago and has since past. I never got the recipe & missed having them. I searched all over & could not find them till I found YOU! Love them! They taste exactly as I remembered. Well worth the wait & I will order them again from YOU! Thank you. Springerles are excellent! Jan 5, 2018 | By J. The Springerle is our Christmas cookie, and we look forward to it every year. This year I decided to "order in," and we were not disappointed. The flavor and texture of these cookies was perfect - just like being in the Old Country. Thank you! Sent Springerles to my in-laws for Christmas gifts this year, and everybody's happy! Wonderful, flavorful cookies. Thank you. Nov 21, 2017 | By Roger W.
Just like Mon and Dad use to make during the Christmas season. Jan 30, 2017 | By G. T.
Great flavor! Terrific to dunk in coffee or tea. Jan 25, 2017 | By Pam D.
My brother loves these cookies and I have not been able to find them anywhere else. He says these are the best!! You are blessed to have such a talent! Jan 9, 2017 | By Richard M.
Jan 7, 2017 | By Mark R.
Comparing to my family Springerly recipe, these are the closest version of I have found. Arrived fresh and moist in the middle. Enjoyed them! Jan 4, 2017 | By Linda F.
These cookies are a memory from childhood and yours were even better than those. Jan 1, 2017 | By Ken B.
Dec 31, 2016 | By Mark D.
Loved the anise cookies - brought back a lot of great memories. Thanks for all you do. have not enjoyed these cookies since childhood. the cookies were delicious. I will be ordering again! thank you!! So unbelievably good! Will make you a tradition every year! Dec 17, 2016 | By G S.
Springerle cookies have been a favorite Christmas cookie for my wife since her childhood. Monastery Greetings is now our favorite place to find them. Nov 13, 2016 | By Greg R.
These cookies are excellent, with the exact amount of flavors needed. They are great for your after dinner dessert and further you into the holiday spirit. Jan 19, 2016 | By Bob P.
Ordered these as a gift for my wife who loves good anise cookies. She says these are the best (other than her grandmother's) that she has ever had. I will definitely order more. Jan 9, 2016 | By Barbara A. We've been buying these for years. They are soft on the inside, crunchy on the outside and have just the right amount of anise flavoring. I love them. My Mom loves Springerle's and after the loss of a local baker, didn't know where to turn for the seasonal treat. I sent her a package from Monastery Greetings and she said they were the best Springerle's she'd ever had. She delighted in sharing with her friends. This holiday I was feeling nostalgic for these cookies which are near impossible to make in a humid climate. I found them on-line, loved them and tried to order more. They were out. Next year I planned to order several Early in the season! Jan 7, 2016 | By Mary M.
My order came quickly but was incorrect so I called and they immediately sent me the correct item. Thank you so very much. It made our holiday extra special. Jan 3, 2016 | By Toni W.
These were the best!!!! They reminded me of the ones my grandma used to make. Dec 31, 2015 | By Megan F.
These are just like the ones I had at holiday time with family in Ohio. Dec 27, 2015 | By George S.
These are beautiful cookies and have long been a holiday favorite in our household. Dec 18, 2015 | By Mary F.
Best Springerle's I ever tasted - so fresh, moist, and delicious! Perfect size and flavor, reminiscent of those I enjoyed as a child. I tried to order more but they were sold out.